Musical highlights from over a century of song and dance in kid-friendly arrangements. Do you hear that beat? It's the sound of people entering the theater on the most famous street in the world. It's the sound of dancing feet and orchestras tuning up. It's the sound dreams are made of. It's the sound of Broadway. Celebrate musical theatre with hits from Hairspray, The Music Man, The King and I, Wicked, Rent and Grease, and a medley of favorites from George M. Cohan. This unique musical collection for upper elementary and middle school students features seven kid-friendly arrangements for unison voices, piano accompaniments, and fun facts about Broadway by John Jacobson. Extend learning further with a Broadway timeline, board game, and recorded history with music excerpts spanning over a century of song and dance. It's the beat of Broadway and nobody can stop it. 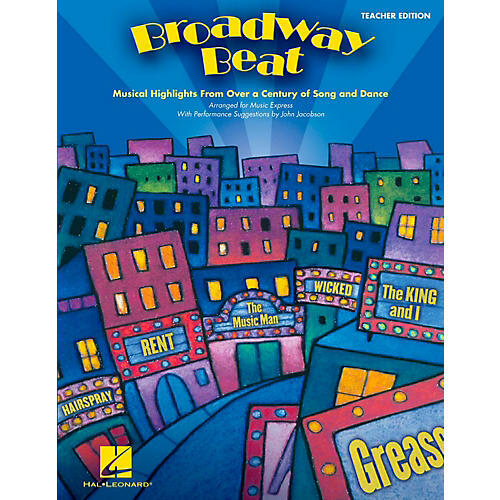 Turn your elementary students into the music of Broadway with this great songbook. Order today.